Okay, let's get to the point. 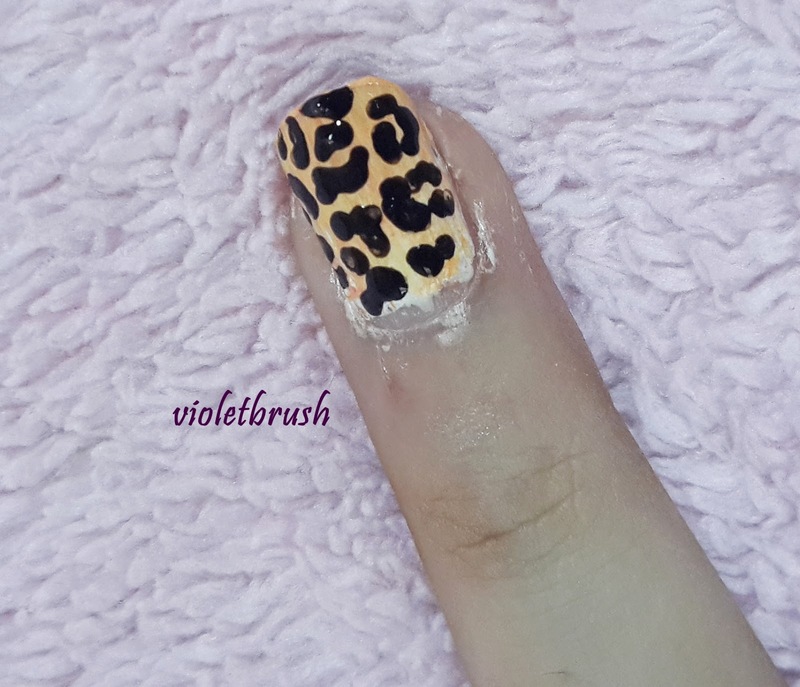 Doing this leopard print nails is actually quite easy. 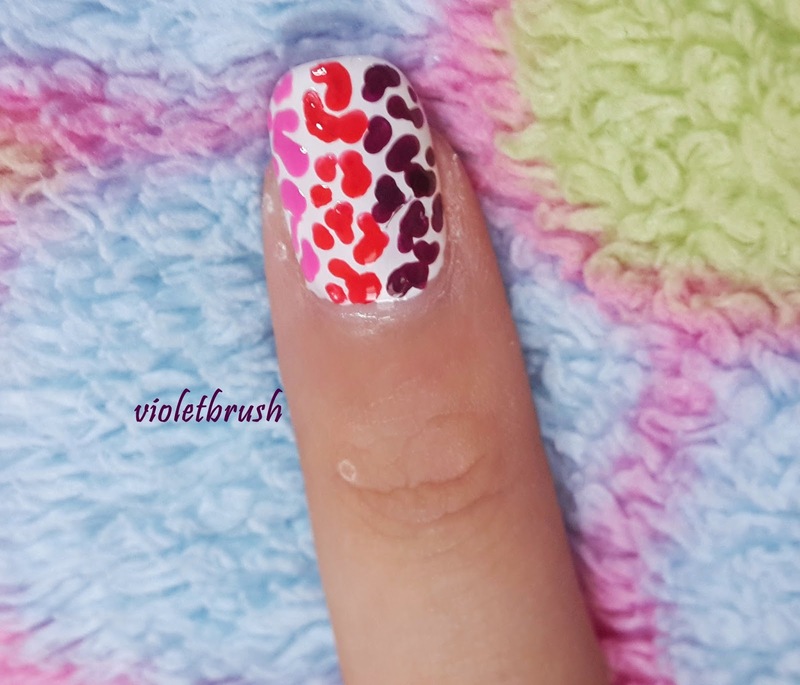 Using your dotting tools, create random, messy, and curvy lines on your nails and voila! You're done. First. Apply base coat to your nails. Remember, this is quite important in reducing your nails damage and for a smooth finish. Second. Apply white nail polish as a base. Leave a little amount of space (around a millimeter) from your cuticles to let your nails breathe. Apply quick dry nail drops gently to save your time. Third. Take a piece of tissue (or paper, used magazine, etc.) 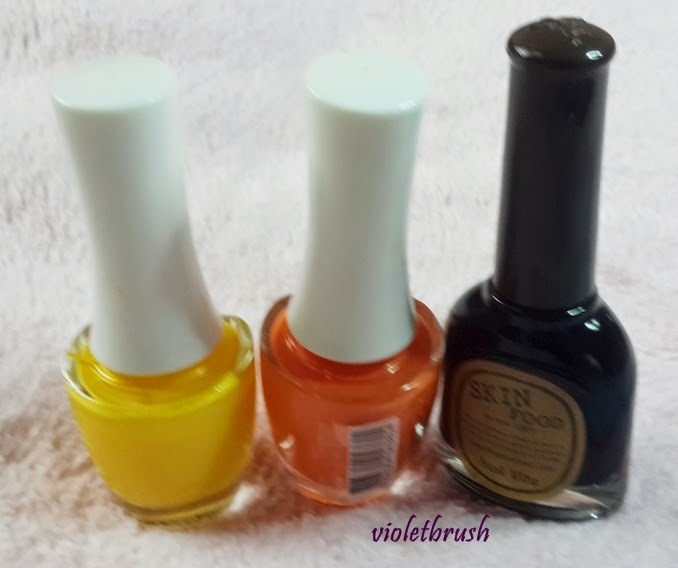 as a media to mix your nail polish. 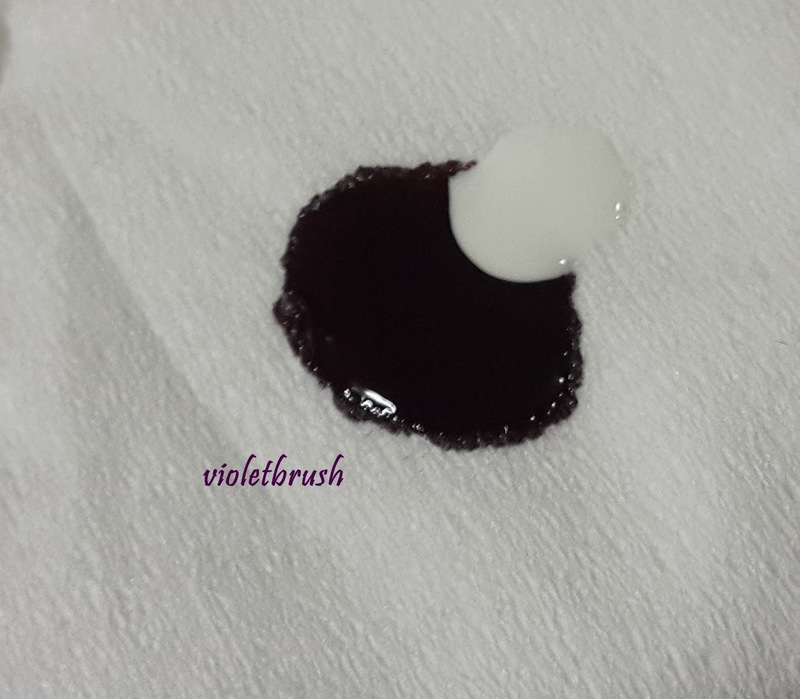 I mixed my black cherry nail polish with my white polish to create lighter shade (1:1 ratio). Never mind the picture below since later after I took the picture I decided to add more white polish. 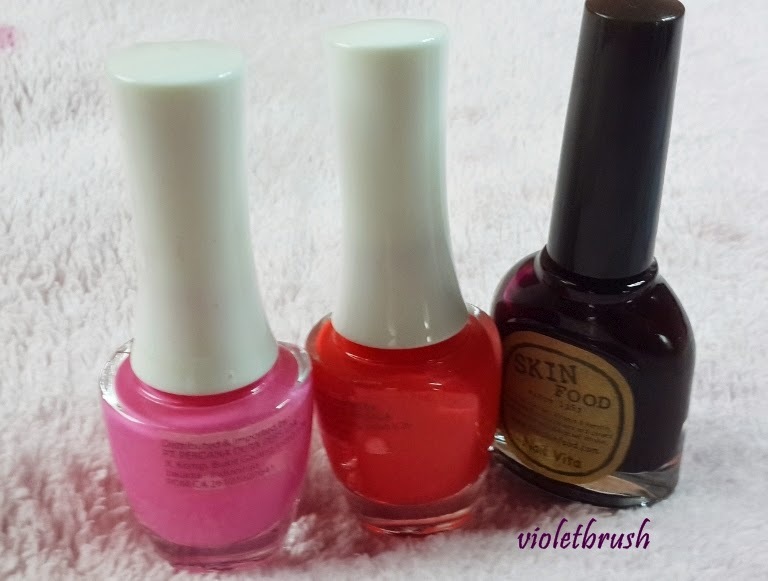 Mix the nail polishes evenly using a dotting tool (or a toothpick, used ballpoint). Fourth. Split your nails into three imaginary part. 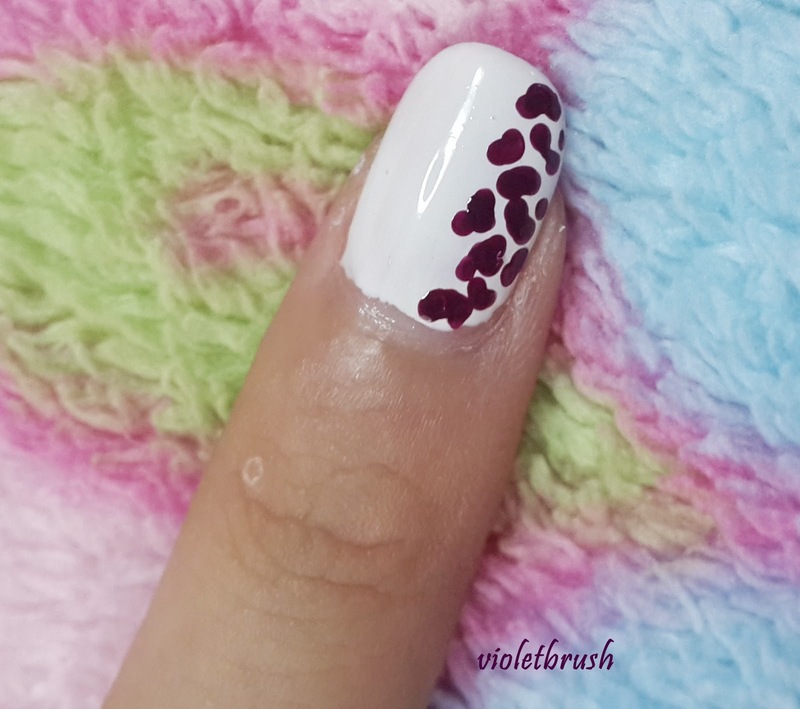 On the right part, create leopard prints with the nail polishes you have mixed in step 3 using dotting tool. Fifth. 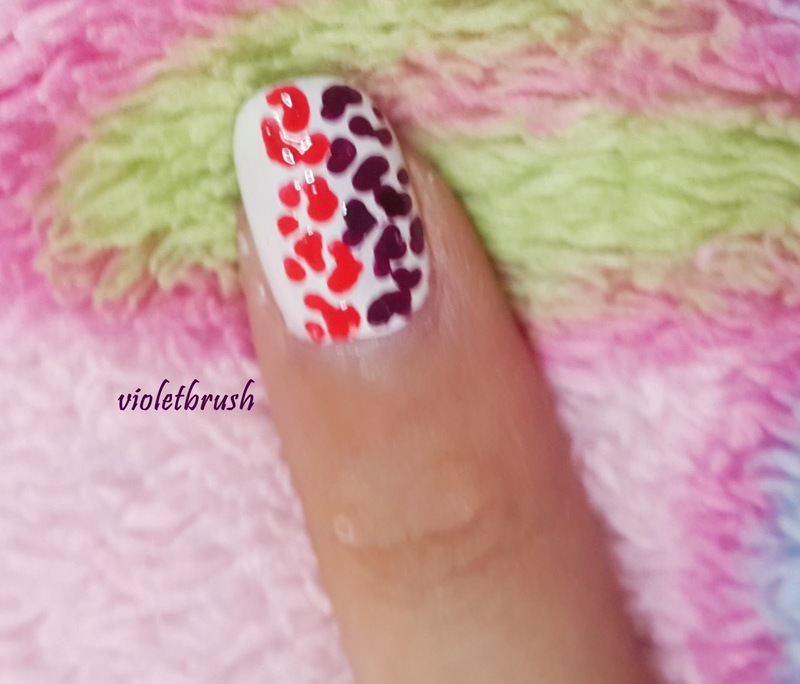 On the middle part, using the same techniques, create the leopard prints using bright red polish. Sixth. 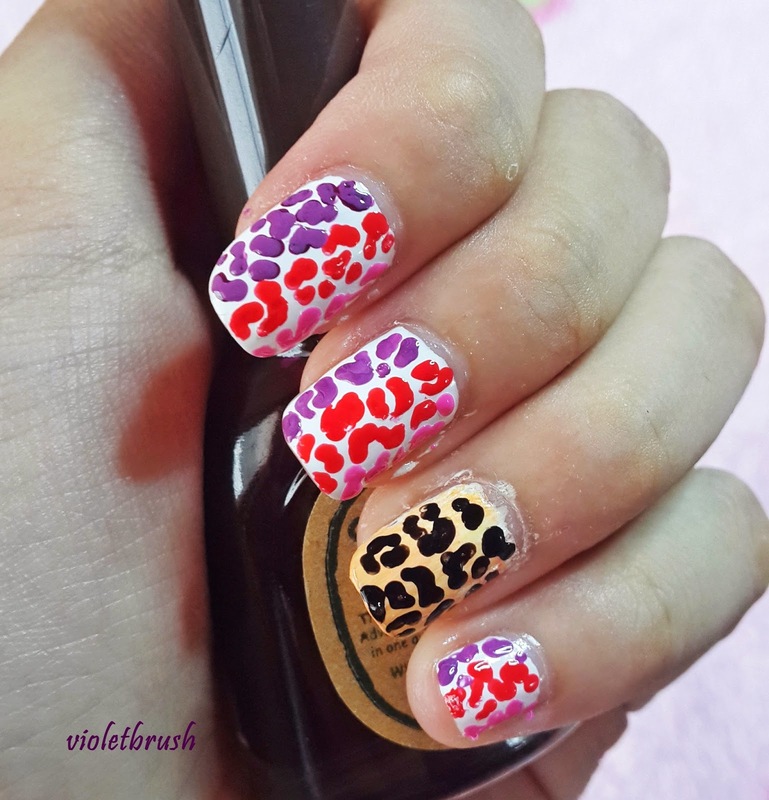 On the left side of your nails, create the leopard prints using bright pink polish. Seventh. 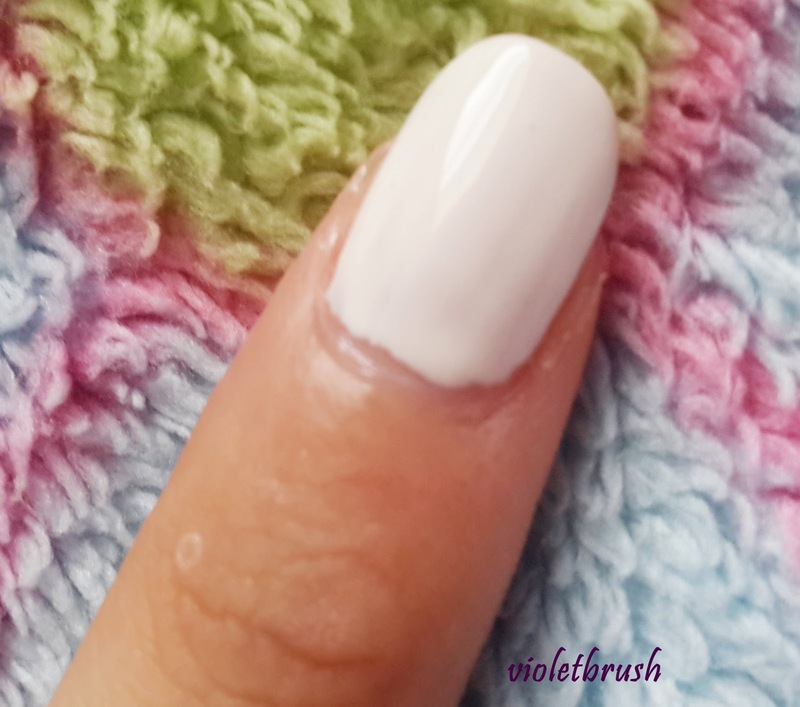 Apply a quick dry drops and apply top coat for long-lasting result. 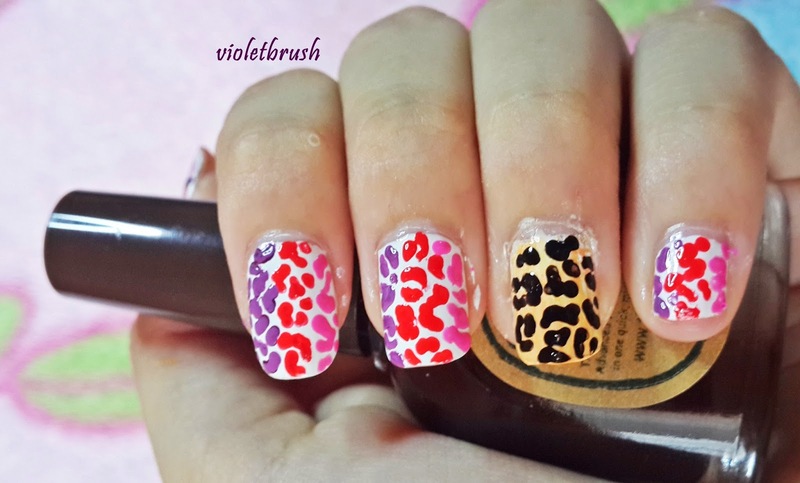 For the ring finger, I created a little bit different leopard prints. Here is how to do it. First. Repeat step 1 and 2 from above. Second. 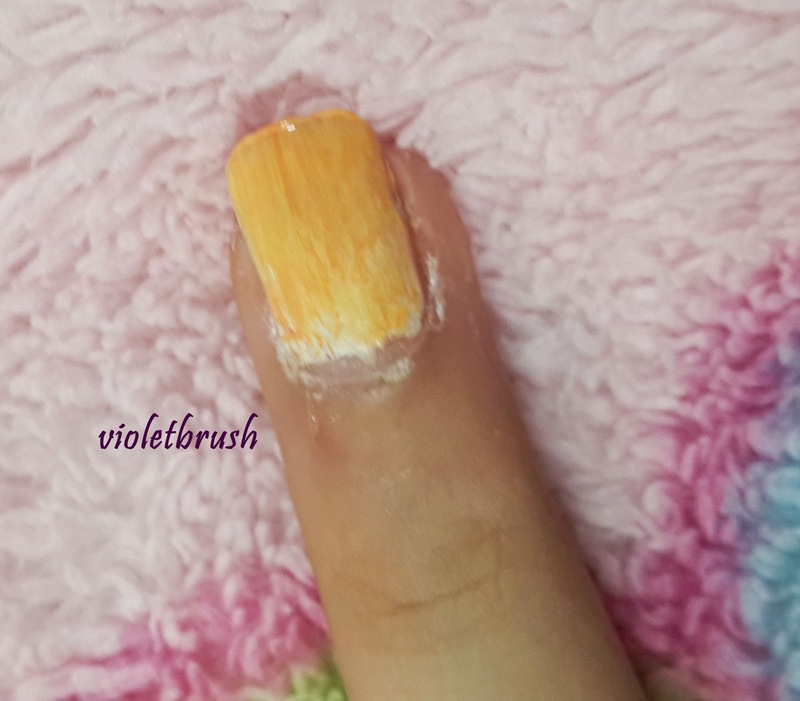 Apply white, yellow, and orange polish to a makeup sponge to create ombrè look. Third. 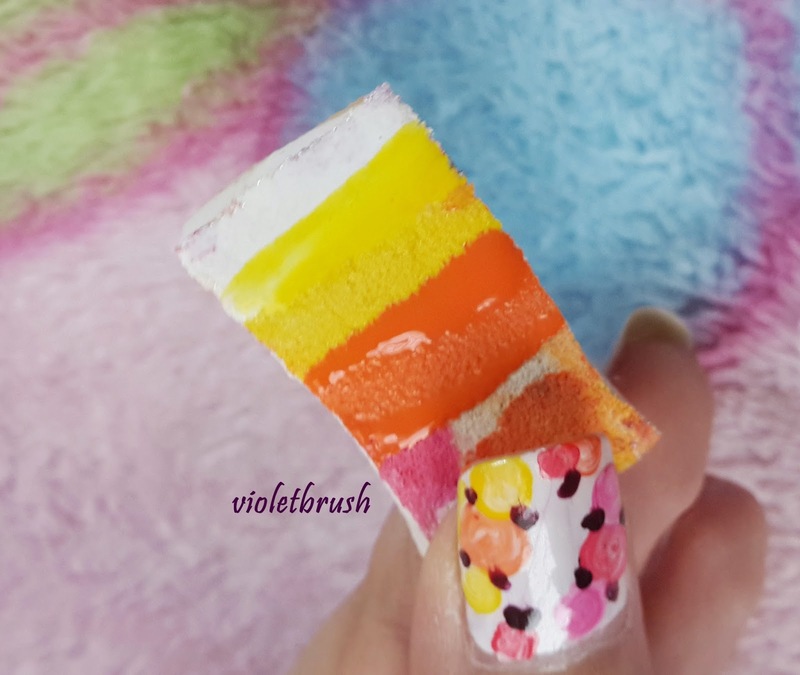 Apply the sponge onto you nail from the cuticle to the tip. Do not apply it back and forth, apply it in one way (?). You might want to repeat this twice for a better result. Fourth. 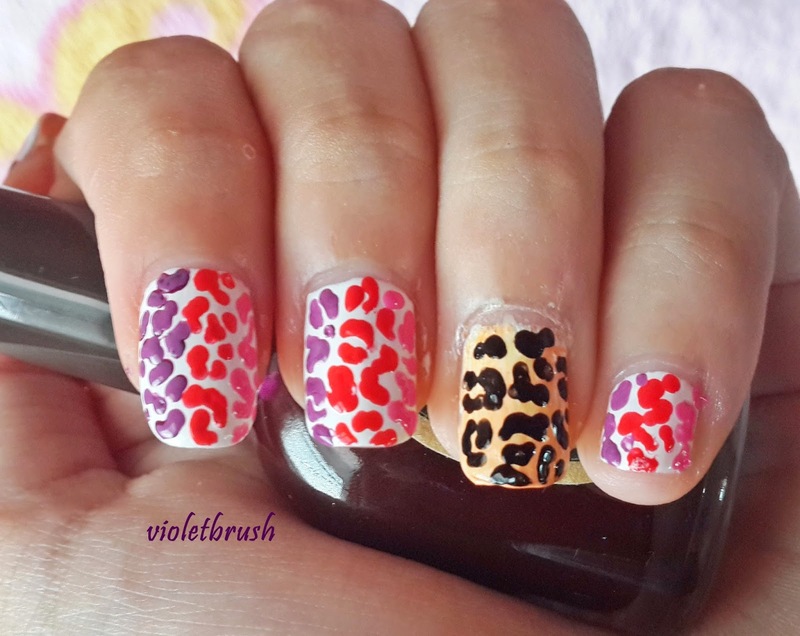 Create another leopard prints all over your nail with black polish. Fifth. Repeat step 7 from above. 1. 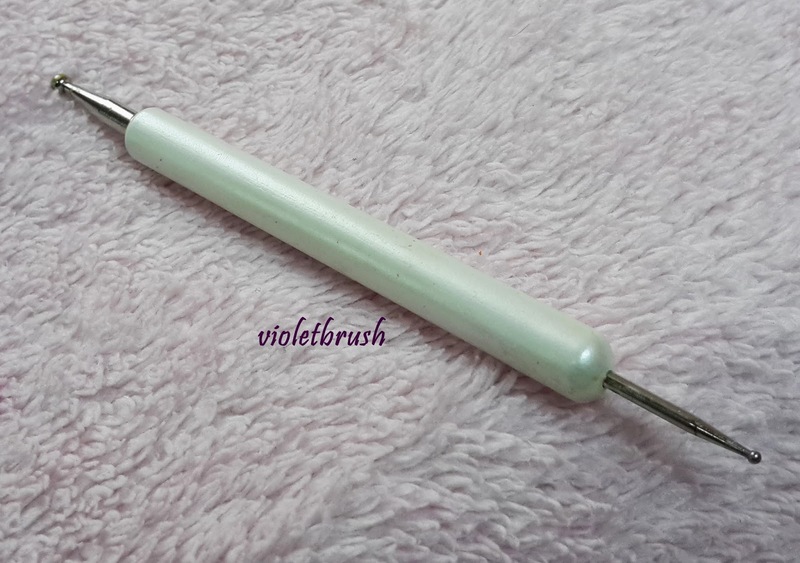 Always have a cotton bud next to you to clean up the 'excess' messy nail polish. 2. Apply top coat a few hours after you've done your nail art to ensure the nail polish has been really dry to avoid the nail polishes getting smudged.